Growing up in New Jersey, October 30 was more than just the day before Halloween. It was called Mischief Night, and apparently it still is, but according to my research, I learned that it is primarily a New Jersey tradition. Inhabitants of Kansas, Utah, and North Dakota would fail the Jeopardy question: What holiday involves toilet paper, eggs, and shaving cream? I recall going out with my friend, Karen, and wandering the streets near my house armed with toilet paper to decorate the trees and bushes. Looking back on this now, I cannot imagine why my parents would have allowed me to do this—both because of the minor vandalism involved, and more importantly, the fact that they would permit us to do this at all. I did not allow any of you to do this, did I? What were they thinking? I could go on, and I was planning to discuss the history of this night, but then we turned on the television and saw an extremely unsettling commercial. It involved a man and woman discussing bowel movements! Not the code-name “number 2”, but bowel movements! Take a moment to think about that. This was more than just a casual conversation between friends. It came with the visuals of them sitting on the toilet. What has this world come to, I ask? Is nothing in this world sacred anymore? 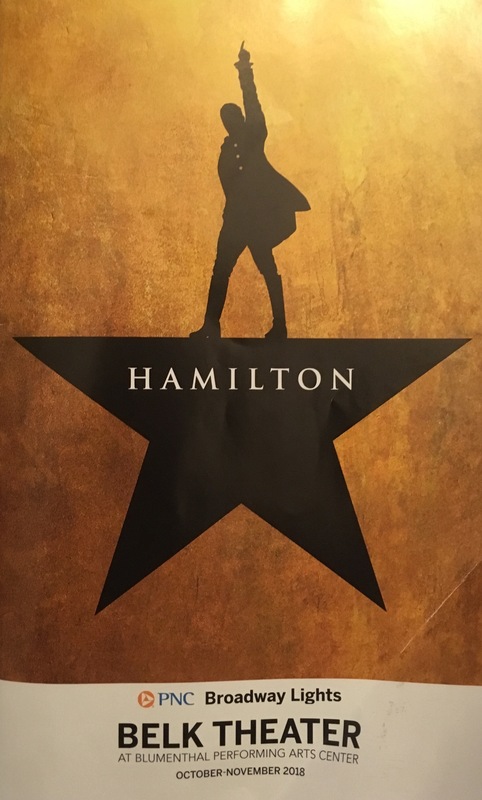 We went to see “Hamilton” last night, and I admit I was nervous. After all the hype surrounding how wonderful the show is and therefore how difficult it is to score a ticket, I worried that I would not like it but would admit it. I did not even know the music was predominately rap. I am so uncool. I am happy to report that I loved it—honestly! I realized how little I know of American history. I know the history of the explorers: Christopher Columbus, Ferdinand Magellan, Vasco De Gama, and Henry Hudson to name a few. I know about the Civil War from the point of view of a Northern education. Sad to say, I did not know that Alexander Hamilton was responsible for our nation’s banking system nor did I know how his son met his fate. But the incredible show was not all that was memorable. Did I mention the bathroom at the Blumenthal Theater? My friend Mary and I decided to pay a visit to “the loo” during intermission. As soon as we exited the theater and feasted our eyes on the line, I believed I would just have to cross my legs and think of little but the desert during Act II. No way would we make it inside the hallowed halls of the bathroom before the curtains rose for the remainder of the show. Little did I know that once inside, we would be presented with 48 stalls manned by two women traffic directors, who moved traffic in and out with indescribable efficiency? Did I mention that it was very, very clean? Mary and I completed our mission with time to spare. If we had wanted, we could have filled our bladders with a lovely glass of red or white. As someone who critiques all bathrooms, this was truly noteworthy. An award-winning bathroom, great company and a memorable show. It could not get much better. The countdown begins. Stores are already decking their halls, and children are making their lists for the jolly old elf. Therefore, it should not have been surprising that Bryce would want to discuss his most-wanted gift with Dad and me already. 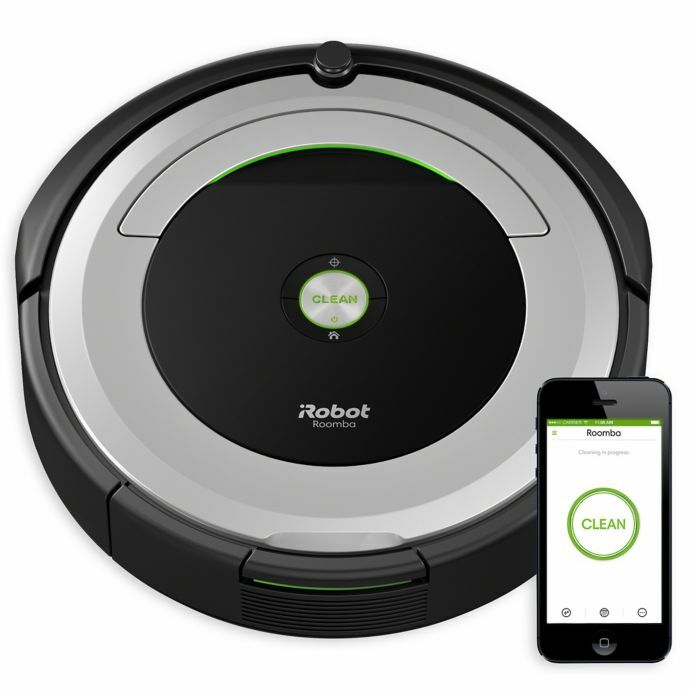 “Grandma, do you know what a robot vacuum is?” he asked me this week. I immediately thought of the round vacuum that my own parents had, but he could not possibly be speaking of that, could he? He went on to describe this very cool floor-cleaning device, which could clean both the carpeted floors and wood floors as well. When I mentioned it to his mom, she informed me that he was indeed interested in this household helper. He wanted to show it to her, so he went to YouTube and tried to find it himself—typing in R-B-T. Mommy explained that he needed to add a few “O’s”, and once he had typed in R-O-B-O-T followed by “V,” up popped an array of videos. “It costs a lot of money,” she pointed out to him. Well then, how do you respond to this? I am willing to bet that Santa will not receive this request from a single other child. When I was in high school, I was so shy I would not wear red because I wanted to blend into the woodwork. In college, I took a mandatory speech class and began to feel just a bit more at ease. Then I ran into my old fifth grade teacher, who casually and cruelly commented that “I guess your braces did not work.” I lost what little confidence I had gained. Now after more than forty years and two more sets of braces later, I feel I have come a long way. It has not been easy, and I am still more comfortable writing a letter or story than reading it aloud. It took a forced reading in a small church in London, an interview by Irish television, radio, and two newspapers to finally calm some of those anxious feelings. This week was another test. I was asked to read a letter I had written to my congressman regarding my frustrations in trying to communicate with him during my weekly visits to his office. This reading was done beside his opponent in front of a camera in the presence of several constituents, but I survived the experience! How did I get myself into this mess? In the days preceding the event, my neck hurt and my blood pressure was up again. Now it’s over. I have gained another day of the week to do as I wish, my neck no longer hurts, and my blood pressure has returned to normal. November 6 cannot come soon enough! Outwit, outplay, outlast. This is not just the slogan of television show “Survivor,” but also representative of life with a 2 ¾ year old. The most recent challenge revolves around how to keep her in her room at night. The method had been to temporarily secure her there after teeth/story/prayer time were over with what is known as a monkey lock, and then remove it after she was asleep. While this device had been quite successful in keeping her and big brother from Mom’s office and her room until recently, her genius mind has now consistently been able to outsmart the lock. The first escape occurred the night that she decided to place a diaper box inside her hamper so she could climb high enough to release the lock. She then ran victoriously downstairs with her pants off and a smile of accomplishment on her face. Mom and Dad removed the hamper and every box from her room, but that did not stop her. No siree! The little thinker next removed every book from her bookcase and then piled them up until they were high enough to reach the monkey lock. It also created a wall which made it difficult for her or her parents to open the door. So she needed to come up with a third plan. She hooked the top piece from her Minnie Mouse car onto the door knob, and then pulled it back and forth until the force of this action slid the monkey lock low enough for her to reach the lock and open the door. Another success! Holy cow! The score is now Child 3 and Mom and Dad 0. How do you outsmart this child? I assume that a lot of people have taken a break from Facebook and texting and emailing and making phone calls for a while. That is the only explanation I can surmise after the silence we experienced today. Looking back on my Facebook posts in September, I admit that I have only myself to blame. Prior to Hurricane Florence hitting our state last month, I posted a series of photos, beginning with “the calm before the storm,” and ending with a photo after she had left town. Today, I was awoken at 4 am by the wind of a much more powerful storm—Hurricane Michael. I slept through the tornado warnings so I did not have to stress about where to hide. 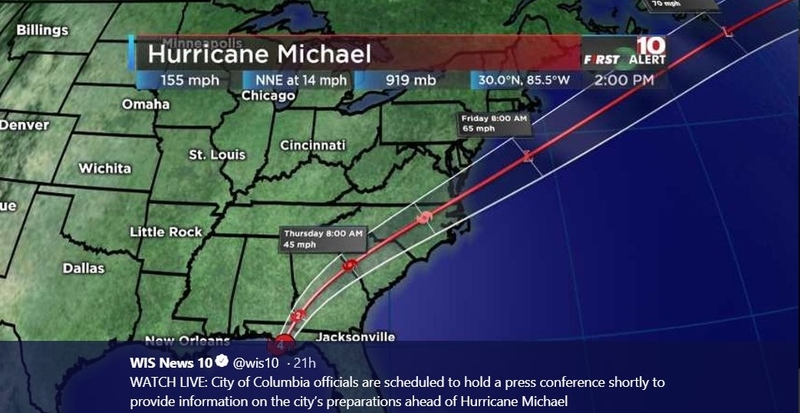 By no means did we experience the path of destruction which Florida and Georgia saw when Michael invaded our southern neighbors. However, I thought I would get inquiries from more than just two friends. Just two!!! FYI, we experienced more rain and wind today than during Florence. We will have some cleanup to do. I saw the weather maps on the national news, and it was quite clear that the path of the storm went right through Columbia, SC. But I was too busy moving my furniture indoors and watching the water being driven up the hill to think about posting on Facebook. I assumed someone would ask about our welfare. Now I know the names of the two people to add to my will. I completed another book, girls. This is becoming quite the habit. I am uncertain whether this is my last book or if I will get inspired to begin another. In my mind, I have written two, because I am not counting the family history since it is really Aunt Marian’s baby. 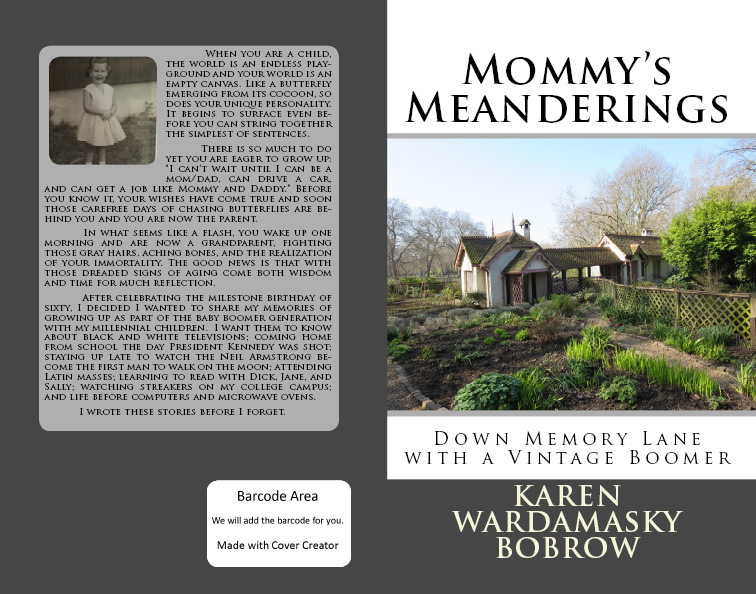 I just took her work and created a book. 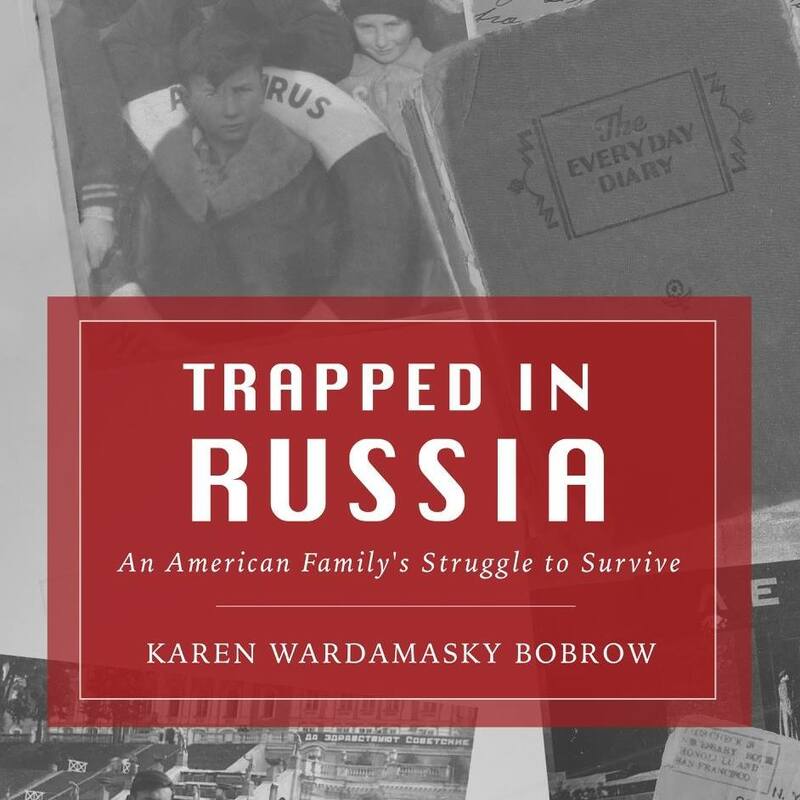 The second, “Do Svidanya Dad—Tracing the Story of an American Family Trapped in the USSR” is really my first, and it sucked the life out of me because it took soooo many years to research and complete. 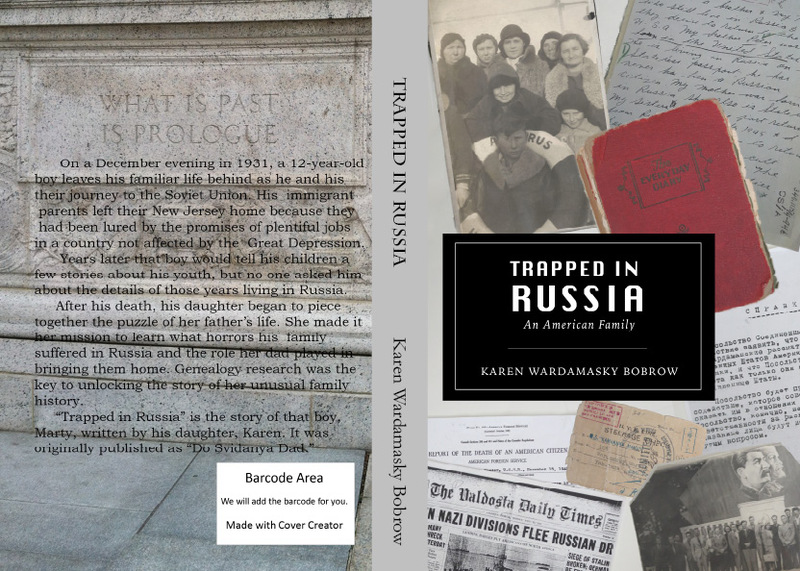 Having self-published that book now two years ago and seeing little interest during two book fairs, I decided to change the cover and title because I thought that maybe a change would make a difference. After all, Russia is still a hot topic, but perhaps the title is confusing and the cover is just not eye-catching. 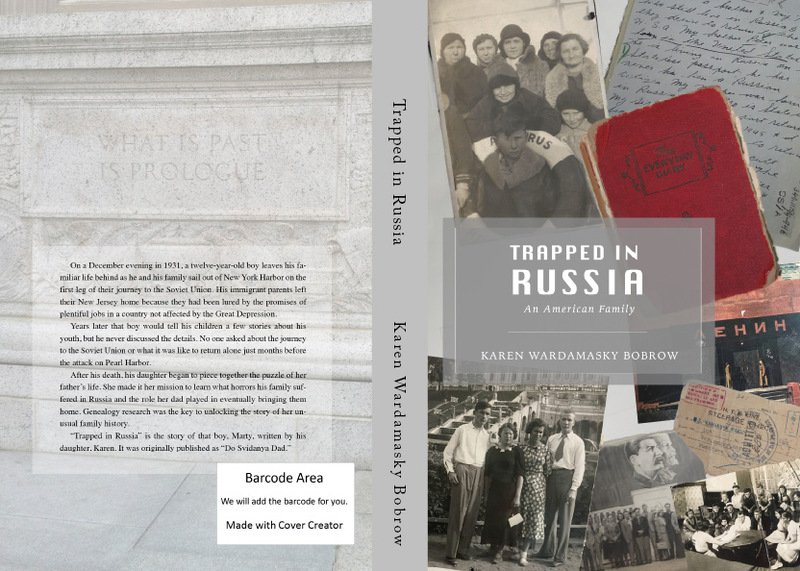 So I brainstormed with my book club and a few friends via Facebook and came up with the new title: “Trapped in Russia ~ An American Family.” I am now working on the revised cover. What are your thoughts? Similar to the choices when going to the eye doctor, do you like #1, #2, or neither? If neither, what would you do differently? I am truly interested in feedback. I truly don’t know what I will do with this book regarding promoting it or not. I am uncertain of the interest level for this book. Dad refers to it as a “bathroom book.” Frankly, I disagree. I hate to ask this, but do women “linger” in the bathroom as much as men? I think this is more of a “I want a quick read before bedtime book.” What do you think?